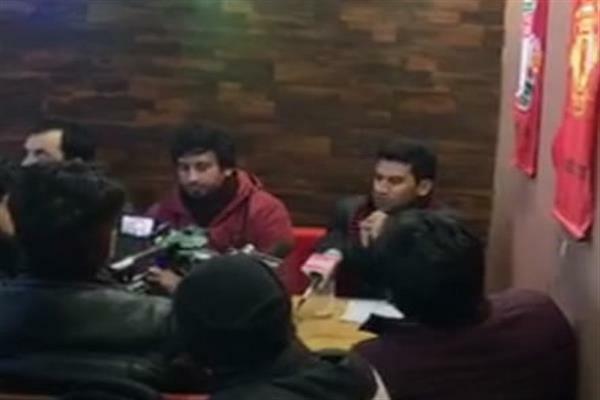 Srinagar, Jan 20 (KNS): Anti-corruption and Governance Forum held a debate on increased corruption and institutional paralysis in the state in Cafe Ta'am in Baramulla, today. The torch-bearers of the movement regarding transparency and good governance in the working of the institutions of the state delivered well-researched lectures to educated young audience. The scholars, teachers, students and social activists were present on the occasion. Hamid Rather, patron of “J&K Anti-Corruption and Governance Forum” spoke on various policies and recent SAC decisions like incorporation of SSA/ReTs teachers in the newly created cadre of teachers by creating 28, 363 supernumerary posts and calling back the referred posts from JKPSC and JKSSRB, SRO 202, Sub-inspector, fire-service, KAS-2016, horticulture officers and court managers recruitment irregularities. He said, “Our recruitment bodies like JKPSC and JKSSRB have become defunct and non-performers. It is the time for making the office holders accountable and complete overhaul of such bodies before it leads to more anger and frustration in youth". "This decision of SAC is unconstitutional as it infringes the fundamental rights of equality and public employment of the permanent residents of state conferred on them by section 10 of J&K Constitution. They could have put some reservation, say, for instance, 30% from direct- recruitment of teachers in addition to some reservation from the indirect recruitment for incorporation of these SSA/ReT teachers after creation of 41,000 instead of 28363 supernumerary posts and could have prevented trimming the job opportunities for unemployed youth", he further added. Owais Nanda, another social activist also spoke on the occasion. He highlighted the collapse of the state machinery in providing good governance. He explained in detail to the exalted audience the different models of governance. He questioned the unscientific working of JKPSC of bringing reforms. Nasir Hussain, a prolific speaker, while delivering his passionate speech laid more focus that youth should not lose hope that we are fighting against an unjust and unmoving system and nothing is coming out. Time will come when we will see the fruits of these struggles. We may fail in getting the results we struggle for but we should not fail in making efforts in that direction.